An emitting body can be optically thick. The conditions are such that the photons scatter, or are absorbed and re-emitted, many times prior to being emitted from the surface. In this case one obtains a spectral shape known as the blackbody spectrum. The spectrum depends upon the temperature of the emitting body. Many ordinary objects emit radiation that approximates a blackbody spectrum. Objects at room temperature (T ~ 300 K) emit photons with a spectrum characteristic of T ~ 300 K (infrared radiation), and a piece of iron heated until it glows a yellow color emits at T ~ 1100 K. At ~5000 K, the color is "white hot"; which is typical of the sun. These spectra are also called optically thick thermal spectra in contrast to the optically thin thermal bremsstrahlung discussed above. Blackbody radiation is a well defined physical quantity. It is the radiation one would find inside an evacuated cavity of a given temperature with "black" walls that absorb and re-emit radiation freely such that they are in thermal equilibrium with the radiation in the cavity. At a given frequency and temperature, the specific intensity I(v,T) of the radiation inside the cavity is a well determined function that can be calculated from basic physics principles. It could not be explained with classical physics, but in the early years of the last century, Max Planck was able to explain it in terms of quantum mechanics. where h and k are the Planck and Boltzmann constants and c the speed of light. Again this is a continuum spectrum; the ideal blackbody spectrum has no spectral lines. Also note that the amplitude at a given temperature and frequency is completely specified. There are no other parameters such as the density or charge of the atoms in the source. At a given frequency, there is no such thing as fainter or brighter blackbody radiation at a specified temperature T. The intensity is fixed by T ; blackbody radiation is blackbody radiation, period. The expression (23) is plotted for two temperatures in Fig. 8 with linear axes and with log-log axes. The exponential temperature dependence causes the amplitude to change dramatically even for a modest change in temperature, a factor of 2 in the figure. For this reason, it is often convenient to use logarithmic axes. Figure 11.8. 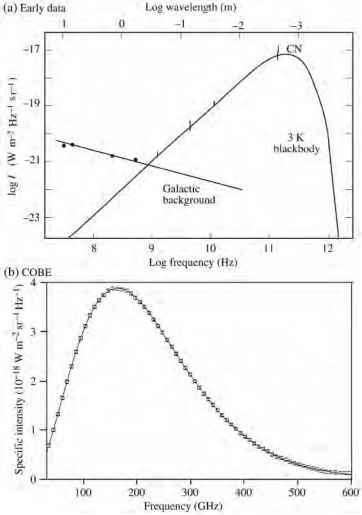 Sketches of blackbody spectra for two temperatures on both linear and log-log plots, according to (23). The temperatures differ by a factor of 2. Note the following features: the power-law behavior at low frequencies, I a v2T, the rapid decrease at high frequencies caused by the exponential term, the frequency of the maximum intensity increasing with temperature, and the rapid growth as a function of temperature. At a specified low frequency, the temperature T may be used as a shorthand for the specific intensity I, since I a T.
This expression follows from an expansion of the exponential, ex = 1 + x + • •• for x ^ 1. It is called the Rayleigh-Jeans law (R-J law) or more appropriately, the Rayleigh-Jeans approximation. Note that it is a power law in frequency, I a v2, so that it becomes a straight line with slope 2 on the low-frequency end of a log-log plot (Fig. 8b). It is also directly proportional to temperature T; a factor of 2 increase in T leads to a factor of 2 increase in the specific intensity in this low-frequency portion of the spectrum. The lowest temperature encountered in space is T = 2.73 K (the cosmic background radiation), and it has a peak at v = 160 GHz or at wavelength X = 1.9 mm. This is at the extreme upper end of the radio band. In the radio portion of the electromagnetic spectrum, therefore, the blackbody spectrum for all expected temperatures is rising. It is therefore usually appropriate to invoke the low-frequency approximation, the R-J law (24), for measurements in the radio region. Since the specific intensity is directly proportional to the temperature of the radiation in the R-J approximation, radio astronomers often report intensities as equivalent temperature T (K) at some specified frequency. The phrases antenna temperature and brightness temperature are used to describe this temperature. For example, the two data points (filled circles) in Fig. 8b may be described as either the values of I1 and 12 in SI units or as the temperatures 6000 K and 12 000 K, respectively. Note that the same antenna temperature T represents larger values of I at higher frequencies. Even if the object does not have a blackbody spectrum, the antenna temperature may be used to represent a measurement of I at some frequency v. At another frequency, the antenna temperature could well have a different value. (It would be the same if the spectrum were precisely blackbody.) One converts from antenna temperature T to specific intensity I with the expression (24), or more precisely (23), where the frequency of the observation is used for v.
Radio astronomers traditionally characterize broadband spectra as rising, falling, or flat according to the behavior of the spectral flux density as frequency increases. Figure 6a shows a variety of theoretical spectral shapes. The rising spectra all have slope +2 consistent with (24) and are called thermal spectra. The falling spectra are called non-thermal. These latter spectra were so named because they do not rise as does a thermal spectrum. Later, it was realized that such spectra frequently indicate synchrotron radiation. The term "non-thermal" remains appropriate because the emitters are ultra-high-energy electrons that are not in thermal equilibrium with their surroundings. Real examples of radio spectra are shown in Fig. 6b. The quiet sun and the moon are largely thermal whereas the radio galaxy Cygnus A, the quasar 3C273, the Crab supernova remnant, and the sky background are all non-thermal (synchrotron radiation). The Orion nebula (an HII region of ionized plasma) exhibits an approximately flat spectrum that becomes optically thick at low frequencies. A beautiful example of blackbody radiation is the remnant radiation from the early hot, dense universe. The cosmic background radiation (CMB) would have had a blackbody spectrum of temperature T ~ 4000 K when the cooling and expanding universe first became optically thin to this radiation. This occurred when protons and electrons combined to become neutral hydrogen. By now the radiation has cooled to T ~ 3 K, and is expected to still have the spectral shape of blackbody radiation. Such radiation was discovered in 1964 by Penzias and Wilson at Bell Laboratories in New Jersey; a Nobel-prize winning discovery. Another earlier indication, in 1941, of this radiation was derived from optical spectral-line observations of starlight absorbed by cyanogen (CN) molecules in interstellar space, but this was before the predictions of such radiation so the result received little notice. (The method of the CN detection was discussed in Section 9.4.) The 1964 discovery was a great surprise because the scientific community did not generally recognize at that time that such radiation would be a consequence of the big bang theory. In fact, its existence had been suggested in the 1940s and its temperature predicted to be ~5 K in a 1950 paper. Early measurements of the CMB are shown in Fig. 9a where they are compared to a blackbody spectrum. Note that the detections at several different frequencies by several different groups verified that the spectrum rises a v2 as expected for blackbody radiation, but the high frequency fall off could not be confirmed with ground-based experiments. The galactic background (non-thermal synchrotron radiation) is also shown in Fig. 9a. One reason the thermal radiation was not discovered earlier is that the galactic background dominated the radio fluxes at lower frequencies where most measurements were made. 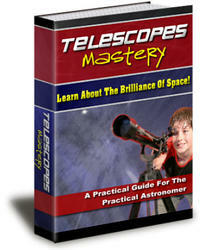 It is only at the higher frequencies that the thermal fireball radiation exceeds the non-thermal galactic background. The spectral shape of the CMB has been determined with great precision by the COBE satellite (Cosmic Background Explorer; launched 1989). The published spectrum (Fig. 9b) shows dramatically the agreement with a blackbody spectrum on both sides of the peak. The temperature is found, also with high precision, to be T = 2.725 ± 0.002 K.
This precise agreement with a blackbody spectrum strongly supports the model of a hot early universe (big bang). The radiation is highly isotropic; it arrives from all directions with nearly the same intensity. This too is consistent with expectations; the entire universe is immersed in this radiation. Ongoing studies of minuscule fluctuations of CMB intensity (temperature) from point to point on the sky with satellites and balloons further probe the nature of the early universe. The overall shape of the spectra of many stars approximates that of a blackbody, and blackbody formulae are often adopted to describe their energy output. Nevertheless the spectrum is substantially distorted by absorption lines and by the effect of the temperature variation with depth in the stellar atmosphere. 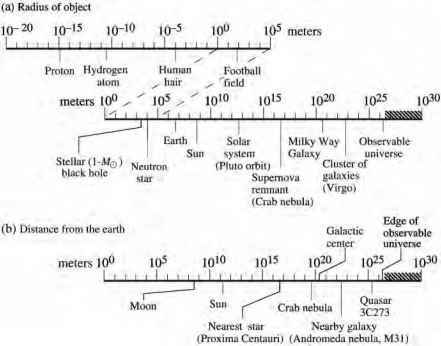 In the spectrum of Canopus (Fig. 10a), the absorption lines are obvious deviations. There is also severe continuum absorption rightward of 365 nm (3.40 eV) due to electrons in the n = 2 state of hydrogen being ejected into the continuum. Photons more energetic than 3.40 eV can be absorbed by the transition. In hot stellar atmospheres, sufficient numbers of atoms are found in the n = 2 level to make this absorption substantial.